Like a magpie you’ll be drawn to the shiny online bingo UK slot game of Starburst – pocket the gems and win big… enough to adorn yourself in shiny jewels! 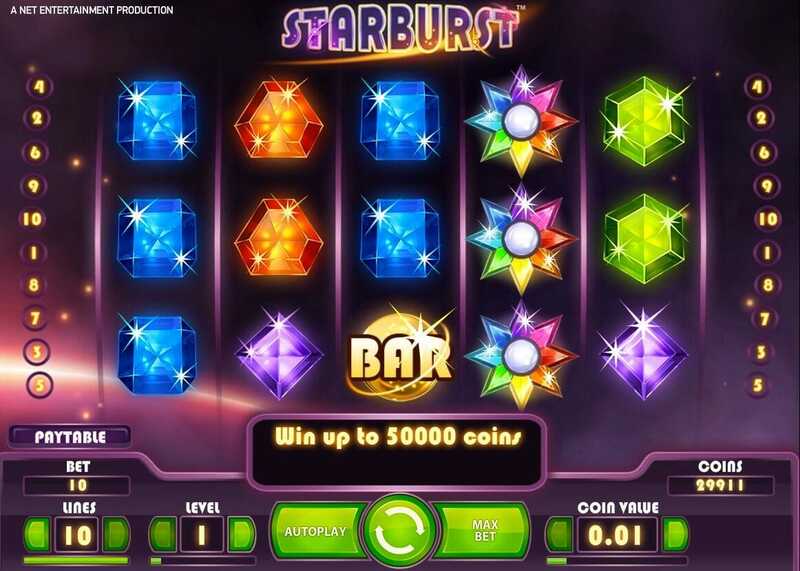 Starburst is a popular game among the seasoned slot gamers due to its high payout rate, but don’t worry if you’re a beginner – this slot is easy to play and lets you bet as little as you like. NetEnt has been making games since 1996, and they’re one of the most successful online game developers in the world. They’ve got a diverse range of online games in their portfolio, from simple and fun games like Starburst or Fruit Spin, to more complex and intricate games like Gonzo’s Quest and Planet of the Apes. Whatever level of gaming you’re at, NetEnt has got you covered. Don't forget to check gambling promotions for updated deals and offers. 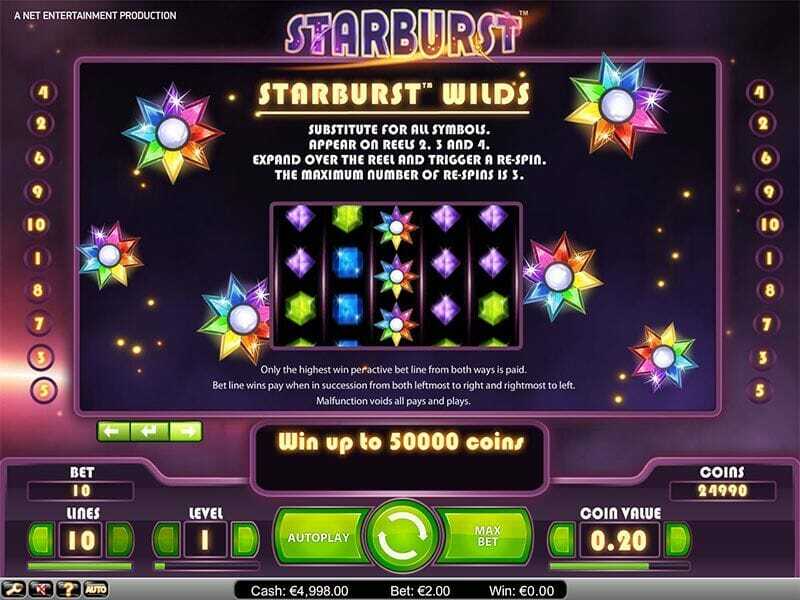 Starburst is a standard five-reel game with 10 paylines to play for – when you start you’ll be presented with a magical and space-like game, with the reels set on the backdrop of a purple background with shooting stars flying by. The game has various coloured gemstones – purple, blue, orange, green and yellow, and then the standard 7 and bar symbols you’d be used to seeing on an old fruity. You can bet as little or as much as you want (up to £100) so if you’re feeling cautious, or just a bit skint, you can bet a penny if you want to! If you’re feeling like you just want to relax and watch the pretty game do its thing, you can even press the auto play button and the computer will do the hard work for you – you just sit back and relax! Wild symbol – the games logo is the wild and can be substituted for any other symbol on the reels. If the wild appears on symbols 2, 3 and 4, it will transform and grow big enough to cover the reels. If you land this expanding wild you’ll be given a free respin – and you can trigger 2 more of them after your first one – and the wild you landed will stay in place, affording you more wins. Bonus feature – the bonus feature of this game is pretty unique, and it’s a ‘win both ways’ feature. This basically means that it doesn’t matter which way you match 3 symbols – whether it’s left to right or right to left, doubling the chances of winning! This game is great in its simplicity, as it’s not got too much going on – but it’s got enough to make it enjoyable, plus it’s in a responsive format for any device! The bonus feature makes it more exciting, and lucrative, as well as the fact that it has an RTP of around 96%. All in all, Starburst is a great slot game that appears small but can pay big. We've listed alternative games you'd like to test here. If you enjoyed Starburst, try this game with high RTP rate too, play here.